A comprehensive review that gives you insight into the latest innovations in network-based project planning, scheduling, and control...saving you time and money on all construction projects. "Faster Construction Projects with CPM Scheduling" contains a full explanation of the new and innovative Scheduling Practice Paradigm, and translates it into tangible steps you can use to create powerful project schedules designed to boost productivity on any job. Completely compatible with the Collaborative Model, the new Scheduling Practice Paradigm provides, commitment planning, execution scheduling, and comprehensive performance control. 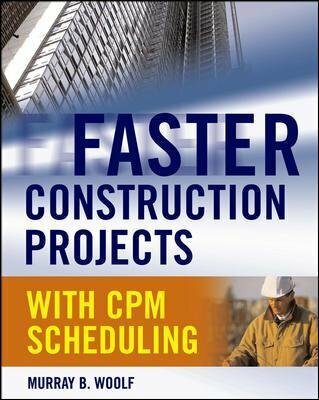 Praise for "Faster Construction Projects with CPM Scheduling"
" A] very strong addition to our knowledge about construction contracting and project scheduling." Matt Stevens, Author, "Managing a Construction Firm on Just 24 Hours a Day "
"I am just glad that I am not alone in the way I see the project controls business. I would like to buy a couple copies of the book for the staff to reads." Craig Olsen, President, Scheduling Consultants, Ltd.
"The book makes some very good points that the novice or even seasoned practitioner should read." Keith Howard, Motorola Inc.